Here is my contribution to Scone week; buttermilk and cape raisin scones. Heidiannie has made lavender welsh scones, and Celia has made lemonade and cream scones. These have two claims to fame, one they are made with home cultured buttermilk and, two they are made with 00 Italian flour. Actually they have three claims to fame, they are light and utterly lovely and I was really proud of myself as I usually make rubbish scones. However Brian ate, let me whisper it … five of these in one go… then he didn’t want supper, what a surprise. There. That’s all. Thank you Rachel Allen, I love your book, Bake. It doesn’t scare me like some cook books do. I’ve made several things from it now and so far so good. I just looked and the scone recipe is here on the net. So there is no excuse for anyone not to join in. 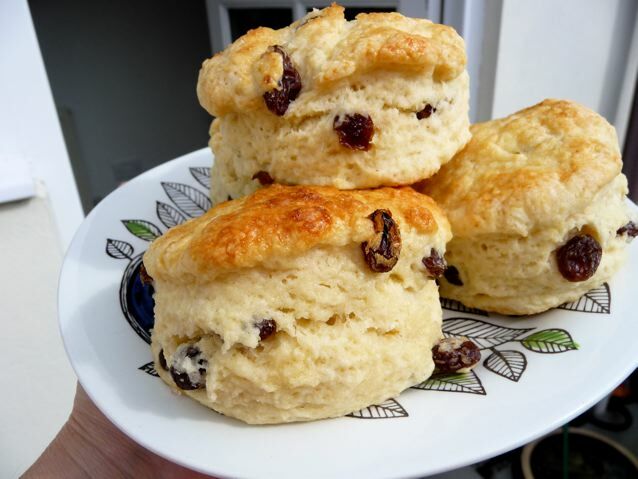 This entry was posted in Bread, Buns, Recipes, Yoghurt and tagged 00 flour, buttermilk, buttermilk scones, cape raisins, Rachel Allen, scones on 11/08/2010 by Joanna.